That Other Kind of Baseboard Heater. Electric baseboard heaters are well known for having all sorts of safety issues. Even though our baseboard covers are designed primarily for use on hot water baseboard heaters, these one piece slip-on covers are considered by many as the best way of making electric baseboard heaters safer around children. See our page on Child Safety for more details. Never remove any components such as the end caps. Electric baseboard heaters are listed electrical products and must not be altered in anyway. You may be required to use the WB001 wall brackets when installing baseboard covers over electric baseboard heaters. None of the covers components should actually touch the original heater when installed. Electric baseboard heaters can get extremely hot. Expect the baseboard cover components to also get very hot. Electric baseboard heaters come in many different heights and depths. Coverage of the original unit will vary, but the open gap at the top will always be completely covered. Convection air current heaters require cool air currents to enter the heater from floor level and are then heated. Heated air rises until it hits the ceiling and as it cools the process starts again. Nothing should be used as a cover along the bottom of a baseboard heater. STEP 1: DISTANCE BETWEEN THE FINISHED FLOOR AND THE TOP OF THE BASEBOARD HEATER. Note: If this measurement is less than 7-1/2", the alternative mounting method that uses wall brackets will be needed. If it is over 9" in height, the Tall profile should be used. Note: It is very uncommon to fail this final check. 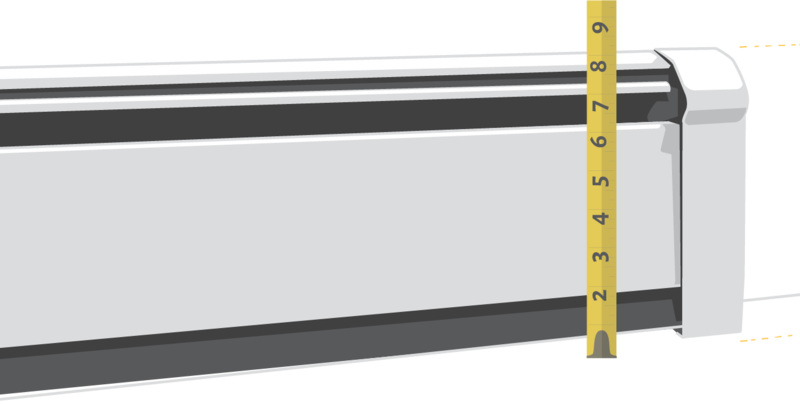 However, occasionally older commercial style baseboard radiators will utilize a 4" x 4" element. The solution to this rare circumstance is to install a molding that frames in the area to be covered. Please click here for more details on this simple work-around.